The first thing you’ll notice when you step into Behrens Pharmacy is how jam-packed the shelves are. The next thing you’ll notice is how low the prices are. Behrens offers unusually good deals on name-brand cosmetics and toiletries. Be sure to check out the selection of greeting cards for only 99 cents each. A neighborhood favorite, Black Iris serves up tasty Middle Eastern cuisine at reasonable prices seven days a week. Pick up an order of takeout, dine in or take advantage of the free delivery service, but just be sure to try it. Falafel sandwiches are $4.50 and individual 10-inch “pitzas” start at $5. 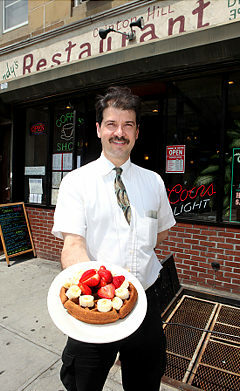 The most popular items on this diner’s menu include whole wheat pancakes and waffles and assorted Greek specialties. In addition to favorites like omelets and burgers, Andy’s offers menu items not found at the average diner, such as broiled tilapia with a choice of two sides for $8.25 and a selection of beer and wines. Head to this neighborhood market for basic groceries such as extra large eggs for $1.99 a dozen and your choice of two Tropicana juices for $3. Or skip the trip to the store and have your groceries delivered. Delivery is free. For more than 50 years, Fort Greene residents have known where to turn for their dry cleaning and alteration needs. A variety of alterations are available from basic hems to inner lining replacement. Get your shirts and pants dry cleaned for $3 and jackets and uniforms for $6. From the $2.50 children’s cone to the 16-ounce coffees for $2, there is something for customers of all ages at Bittersweet. Purchase one of their reusable tumblers and get 25 cents off every coffee you buy to fill it. Want something sweet to pair with your cup of joe? The tasty Balthazar baked goods here are sold for 50% off starting at 3:30 p.m. every day. 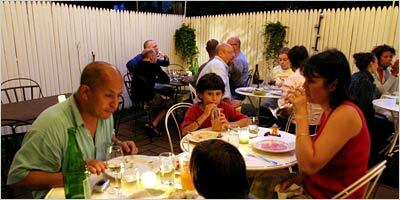 Restaurants featuring foods from around the world with tables out front or in gardens out back. Coffee bars, cafes and pubs with outdoor seating, too. Shops and boutiques with their doors wide open. Plus something of an ice-cream lovers paradise with chefs competing to ramp up the basic egg/cream/sugar formula. And then, there’s one of Brooklyn’s great parks and everything you need for a picnic available at any of a number of spots along the Avenue. It’s summer on Dekalb Avenue. Enjoy! July 4 Food, Music, and perhaps even… sunshine? Live Music on Dekalb Avenue. June 21, 2009. Fort Greene is the place to be, well that’s according to everybody who lives here and now an article that appeared in the New York Post on June 25, 2009. And with DEKALB AVENUE running through the heart of this great neighborhood… only steps from almost every subway line in the city… you can see why. Come for the FLEA, stay for lunch, catch some music and honor those who died for our country and made July 4th possible. Details below and all kinds of opportunities for a nice weekend up and down the avenue. LIVE MUSIC – 11:30AM – FREE! Celebrate Independence Day with a guided tour of historic Fort Greene Park and discover the role this park played in The American Revolution. The harvest is in full gear at the Farmer’s Market at Fort Greene Park. Come for some incredible strawberries and leave with so much more. DEKALB AVENUE at Washington Park in Fort Greene. If you are an early bird, there are several excellent coffee craftsmen and pastry pros within steps of the market. Located just one block from the restaurants, cafes, shops and boutiques of Fort Greene’s DEKALB AVENUE, the FLEA is a browser’s paradise for things old, new and anywhere in-between. Check out the Flea and then work your way down DEKALB AVENUE for a pint of beer, some ice cream, a sandwich, or a leisurely lunch at an outdoor café or… pick up the makings of a picnic and even some wine on your way to Fort Greene Park (though you aren’t really supposed to have an “open container” in public!). Along with some great coffee places, it’s all right here. Kick off the summer on DEKALB AVENUE in Fort Greene. Leave the Hamptons to… well the Hamptons. In the meantime get on your bike, hop almost any subway line or just start walking across the bridge and you are here. BAM is screening a free movie this Saturday, June 27 in Fort Greene Park. The movie is called “What’s On Your Plate” and is a new film that’s being shown as part of Part of BAMcinemaFEST and Afro-Punk Festival. There will be seating available, or people can bring a blanket and sit on the grass. Stop by the many restaurants, cafes, shops and boutiques of Fort Greene’s Dekalb Avenue before heading to the park. Through the eyes of two intelligent and inquisitive eleven-year-old girls from New York we follow the many paths, conflicting economics, and the disparate decision makers who all play a part in what we eat. 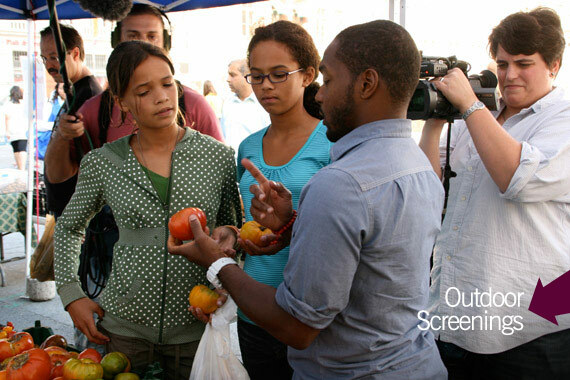 A great film that presents a variety of perspectives on how food reaches our urban community and its associated challenges. 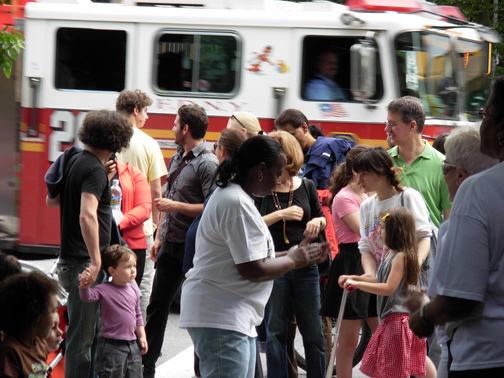 SUNDAY, JUNE 21, 2009 Stroll Fort Greene’s Dekalb Avenue and hear live musical performances all day starting at 11am and continuing until 8pm. (VIEW SCHEDULE) Performances at 3 locations: 1) Dekalb Avenue and Clermont, 2) Dekalb between Carlton and Adelphi and 3) in Fort Greene Park at the Martyrs Monument. There will be over 850 concerts throughout NYC on this one day event MAKE MUSIC NEW YORK, and on Dekalb Avenue there will be a mix of Afro Beat, Japanese Gypsy Rock, Electrified Folk Country & Jazz, plus Gospel and a full program of Opera. Bring dad and have something to eat at one of the many outdoor restaurants and cafes or pick up food for a picnic in Fort Greene Park. Subway: Q/R to DEKALB. 2/3/4/5 to NEVINS. A/C to LAFAYETTE. G to FULTON STREET. And just about every train stops at FLATBUSH. Wow! 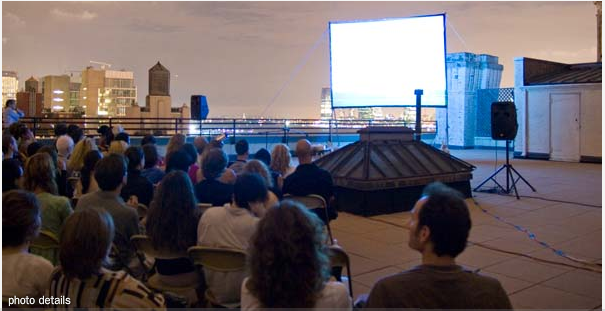 What an idea… catching a movie out under the stars, up on the roof of Brooklyn Tech on Dekalb Avenue in Brooklyn’s own Fort Greene. ROOF TOP FILMS’ 2009 Summer Series has begun. For details and listings visit their website. And know that within a few blocks of this amazing “movie palace” in the sky, there are some of Brooklyn’s great restaurants, cafes, bars and pubs. So whether it is dinner before the movie or after… a pint of beer or a serving of Tiramisu… or even packing a picnic to take with you, it’s all here on Dekalb Avenue (just steps from the Dekalb Avenue Subway station). 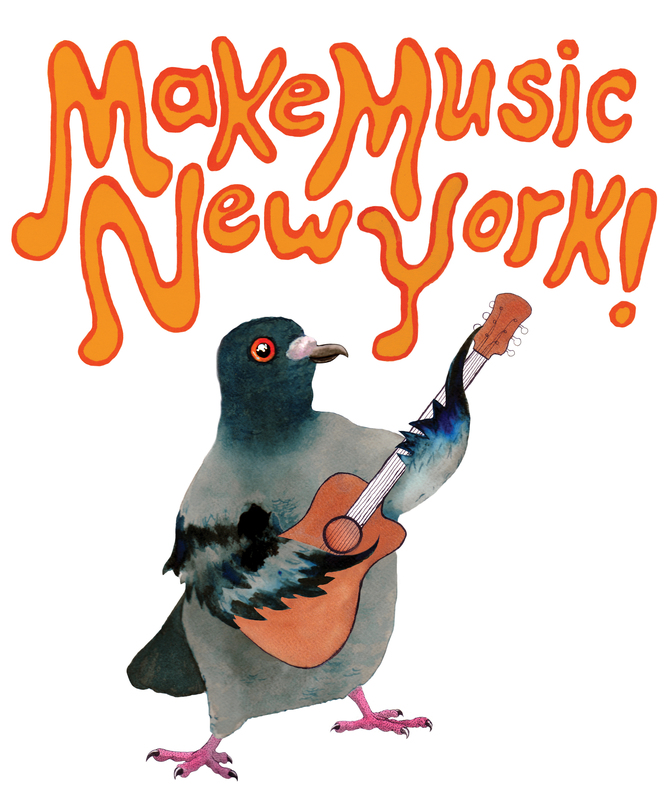 And, be on the lookout for exciting information about MAKE MUSIC NY on June 21, and a schedule of LIVE perfomances on Dekalb Avenue in Fort Greene, Brooklyn! Art, Food, Wine… What a Weekend! The Annual SONYA STUDIO STROLL, showcasing more than 40 artists and their work, plus several public art projects and the PRATT sculpture garden open to the public, is to be held this Saturday and Sunday, May 16 and 17, 2009. It’s FREE… self-guided so you go at your own pace… and is a great way to see the variety of talent in the visual arts that has long made Fort Greene famous. Some art you’ll see in the artist’s own working studios. Other art might be on display in the parlor of their home. And still others are on display in galleries or in retail stores. You can browse like you are visiting one of New York’s great gallery districts or museums (though one lined with historic brownstones and great restaurants, sidewalk cafes and shops!). You can also say to yourself… “that would be great to have on my wall at home!” — because much of the art will be available for purchase. 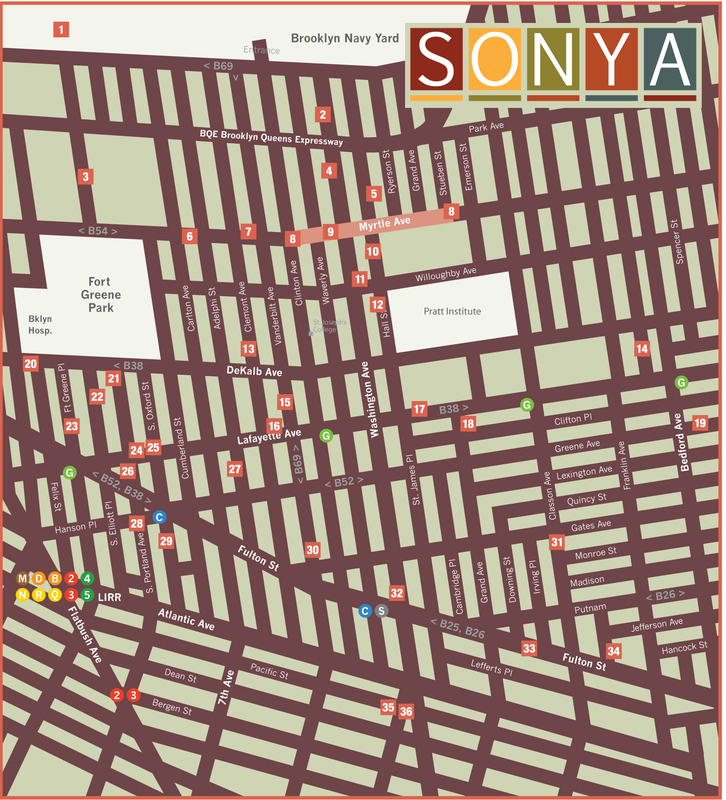 For a MAP and LISTING of the artists, visit sonyaonline.org. DEKALB AVENUE with all its restaurants, pubs, cafes and shops runs through the heart of the tour route, with about half the locations above Dekalb and the other half just below it. So download the map and artists’ listings, pick out the art that sounds interesting (and a couple of extras just to broaden your horizons! ), plan your route and know that you have lots of opportunities to stop for a break along the way (that’s where the food & wine comes in). FYI: The artist’s locations are open from 12 noon – 6:00PM on both Saturday and Sunday, rain or shine.